How has Kendo changed since the Meiji Restoration? I have been practicing Kendo for around 5 years now and have been fascinated by how the sport has changed, in particular since the Meiji Restoration. 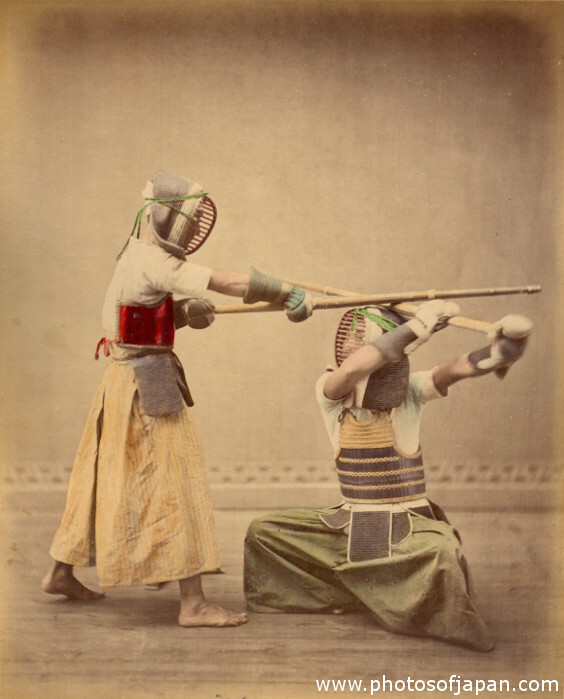 I have several photographs from the 19th century of Kendōka facing off in various studio poses in our collection at www.photosofjapan.com which hint at some of the lost techniques that are no longer practiced. In particular the aikido techniques where throws or grapples seems to be a normal way of subduing an opponent in order to score. 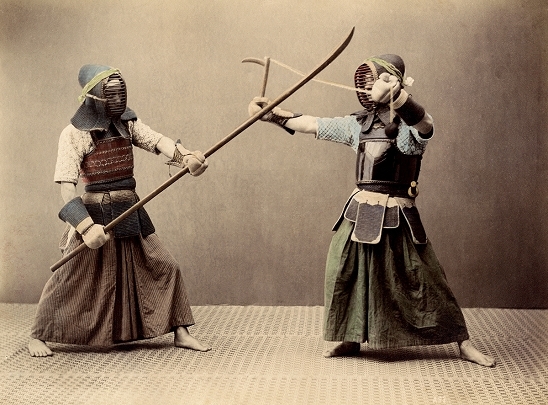 The name Kendo was only introduced in 1920 and prior the sporting form of swordsmanship was referred to as Gekiken. Chiba Shusaku Narimasa (1793 - 1856) the founder of Hokushin Ittō-ryū could be considered the father of Kendo as he introduced Gekiken which was full contact duels using shinai (bamboo swords) whilst wearing lightweight armour known as bogu in the 1820s. The popularity of Hokushin Ittō-ryū during the Edo period contributed to the uptake and wide use of shinai and bogu in Japan. In fact many of the waza (techniques) in modern Kendo are based on techniques practiced in Hokushin Ittō-ryū and were named by Narimasa himself including Suriage-men and Oikomo-men. After the Meiji Restoration in the late 1800s the famous Samurai Sakakibara Kenkichi (1830-1894) popularised Kendo through public demonstrations generating an increased interest in Kendo and Kenjutsu. The sport was banned in 1946 after the war and only reintroduced formally as Kendo in 1952 with the introduction of the All Japan Kendo Federation. I have seen Shinai vs. Naginata in demonstrations though hadn't seen Kusarigama vs. Shinai before and I wonder if any Kendo dojos in Japan still practice the older techniques of Gekiken today. It certainly requires more research and the purpose of this post was to share these fascinating photographs. If you have any further information on the photographs and prints below please add a comment and let me know! Brazil loves Photos of Japan! I've always known there was a relationship between Brazil and Japan and was aware of connections such as the martial art Brazilian Jiu-Jitsu, however I didn't know the full history and how deep the connection was until I decided to do some research based on my surprising website visitor statistics. More than 50% of our traffic since we launched our website only a few weeks ago has been from Brazil! 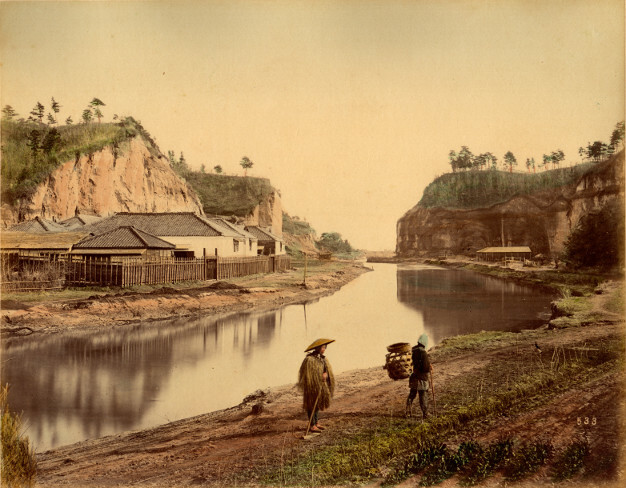 The first Japanese immigrants arrived in Brazil during the Meiji Period in 1908 and there are now 1.6 million people of Japanese descent now living in Brazil. In fact Brazil is home to the second largest Japanese population outside of Japan. In 1907 a treaty permitting Japanese migration to Brazil was signed by the Brazilian and Japanese governments. 790 Japanese immigrants travelled to Brazil in 1908 on the Kasato Maro, about half of them coming from southern Okinawa. Today Japanese Brazilians are known in Japanese as Nikkei Burajiru-jin (日系ブラジル人) or nipo-brasileiro in Portuguese. Welcome to Photos of Japan Brazil! Who created these wonderful Japanese art prints? Many of the Japanese prints in our collection are the work of Kusakabe Kimbei (1841 - 1932). Considered to be one of the most underrated Japanese photographers of the 19th century, he worked with Felice Beato and Baron Raimund von Stillfried from the 1860s as an assistant and photographic colourist before he opened his own studio many years later in Yokohama in 1881. Some of the most beautiful photographs in our collection are landscapes by Kusakabe including his stunning series of prints depicting Yokohama and Nakasendo scenery. Kusakabe was at the forefront of creating souvenir photograph albums for western tourists in Yokohama containing hand-painted Japanese prints of landscapes and studio portraits of everyday life in the Meiji period. For this reason he is still better known today in the West than he is in Japan. His albums also included many of the famous photographs of his mentors as he had acquired the negatives of both Felice Beato and Stillfried, as well as those of Uchida Kuichi in 1885. Although historically the works of his mentors are held in such a high regard for their remarkable record of Japan in the 1860s and 1870s, it can be said that from the 1880s no studio had come close to producing as consistent high quality work to that of Kusakabe Kimbei. The quality of the painting and hand-colouring of his photographs are exceptional and in 1891 Kusakabe advertised himself as both photographer and painter. By 1892 his studio had a selection of over 2000 unique Japanese prints of landscapes and studio portraits of Samurai and Geisha as well as scenes of everyday Japanese life available to western tourists as Japanese art prints for sale. Why I created a website of Japanese art prints for sale? I've been enjoying perusing my grandfather's album of Japanese Meiji period hand coloured albumen photographs since I was a child. The album has been tucked away safely for last 20 years only being taken out occasionally to discover it all over again with friends and family. I have often been asked about making copies of the photos so others could enjoy them also. My daughter recently created a Redbubble store selling her artwork and a light bulb finally went off on how I could share these amazing images. I painstakingly scanned all of the photographs at high resolution and added them to a new Redbubble store and Photos of Japan was born. Since I created the site I have been lucky enough to source a second Japanese album with stunning photographs and now have over 150 in the collection. I plan to continue to research these photos and the photographers who captured these amazing images and will continue to add prints from the collection and update my research in the Gallery. You can visit the Redbubble store to order high quality photographic prints as well as framed prints, posters, art prints and apparel.